The division battles continue, though a lot of second-stringers are going for the leftover stakes dough, splitting the venues for events in the east and Midwest. At Balmoral on Saturday, Nov. 9, the American-National finals adorn the program. On Sunday, Nov. 10, at Dover, Matron Stakes elims begin to roll out in the season’s final stakes barrage. Look below for this week’s H2W list and to check out the TwinSpires Pick-4 bonus at Hoosier, click here. The American-National finals are as traditional as the autumn colors, bringing some of the brightest divisional stars to the Midwest for a rare flight into fortune. The Am-Nats offer some of the largest purses of the year in this neck of the woods. We will cover them in the order of their presentation on the Nov. 9 Balmoral Park card. It’s tough to look away from Southwind Silence. 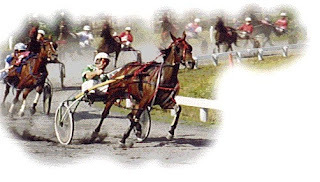 She comes from the most contentious of the Breeders Crown (BC) races, where one of two horses won to pay double digits (we gave you this one with Uffizi Hanover). An outside contender looms boldly here in the form of Wicked Business. Impeded in his Am-Nat elim, he still made up ground to finish third and did so at 40-1. His Hooser race before that is a toss out and he has legit excuses at Lexington. In this mile that is sans stars, he could race to his Balmoral qualifier and storm the tote. Here we go again with the glam-soph colts and an awkward field of them at that. We are still convinced that Lindy’s Tru Grit has another good win in his pocket and he may do it here and at a price. His Nov. 1 race is testimony to our theory. He broke on the lead (as the public choice) but it was his getting the lead in a powerful move that signaled he was up to par. Unfortunately the misstep foiled him but in a smooth mile like that, he wins this. Maven meets the men here, making this a special event, since all of these guys have been far less consistent recently. Her main competition, we think, comes from Mister Herbie, not Market Share, who “Herb” almost defeated in the BC final. Also, expect better going from Wishing Stone and Uncle Peter. It’s a power-packed field but Maven can win. The odds, however, may favor a bet on Herb. Who among us would not choose I Luv The Nitelife? You cannot opt for a longshot here, there is no reason to attempt to swing for the fence. 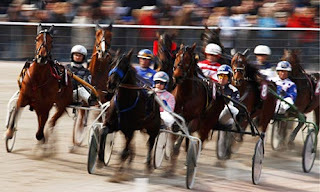 The filly’s connections have reportedly challenged the Captaintreacherous camp to a match race. That’s because there is no looking past either when they race. Auniqueaquistion may make for a strong exacta. Bee A Magician looks to nail Horse of the Year honors here by keeping her win streak spotless for the season. It would be a shame if our old frosh favorite (remember we were on her from the get-go, when she paid well) won top honors without facing the boys—as Maven will earlier in the card—but it is impossible to bet against her here, anyway. She is, after all, one of the Four Horses of the Apocalypse. Don’t budge, it is time once again for The Adventures of Captaintreacherous. We will try again for an exacta with Apprentice Hanover the second element. Again, we take Sweet Lou in the gang of mature male pacers. We see too much speed in play with Pet Rock and some others and hope that our high-priced “Lou” will race late off of deadly fractions to beat these warriors, a somewhat battered bunch from a long and tiresome campaign. Let’s look at some possibly profitable offerings in the Matron elims beginning with the two-year-old miles. There is a single elim for frosh-colt pacers and it features a return to the races for the unsuccessful Breeders Crown (BC) favorite, So Surreal. He broke in the final and leaves from post 8, two factors that may make him soft in the betting. From the same family is another son of Somebeachsomewhere, Lyonssomewhere, who is undefeated in two races and has every right to improve here. In the first frosh-colt trot, Don Dorado also returns from “Crown” action and if he can stay flat he can trot high and fast, perhaps at a decent price considering the Muscle Hill products in here may be given some heavy play. In the second split for this division, the big favorite will be Nuncio and he deserves the attention after chasing Father Patrick to be second twice in his BC elim and the final. If you like the short price, go for it. Exotics could be pumped by the longshots here. The frosh-filly pace elim promises 11 will appear at the gate. There are huge earners this season in here but we will support a higher-priced Bettor Business. Bound to be dismissed at the windows for having only one win in 10 starts, this is a speedball that has the capacity to command the pace here and strike hard to get into the final as a top choice. The two-year-old filly trot is a Matron preview, not an elim, and all you have to do is hope Shake It Cerry doesn’t break because this appears to be a qualifier for her. She was so good in the BC final and she towers over the other seven here. The sophomore fillies have two elims. In the first, Somwherorarainbow is bound to be the top choice but she is not a shoe-in. Summertime Lea has used her speed to win eight of 14 and hails as a major threat here. In the second elim, the big choice should be Shebestinin and no doubt she will be flying to take it all the way from the rail. However, Ms Caila J Fra could have something to say and make a late impact that changes the public’s desired outcome. The soph-filly trot is a single episode, with a few recognizable gals that have been beating each other in battles all season. Ma Chere Hall may be a better price than some would think considering some money will be handed to Southwind Cocoa, while Thistle Dhu may like the 11 hole and surprise them all. Glamour-boy pacers are stacked with second-tier stars, including last week’s winner over Captaintreacherous, Dedi’s Dragon. Messenger-winner Ronny Bugatti may get some money, as will Vegas Vacation, even from post 10. If all of this gives Sunshine Beach and Emeritus Maximus some breathing room, then those two could be on top at the finish for a healthy exacta combo.